After dramatic rescues, some 900 people still on board as the cruise ship reaches Molde port on Norway’s west coast. A stricken luxury cruise ship that set sail with almost 1,400 passengers and crew on board has arrived at the port, after it narrowly escaped a major disaster when its engines failed during a storm. The Viking Sky sent out a mayday signal on Saturday as it drifted in rough, shallow waters in the Norwegian Sea to within 100 metres from rocks. Rescue services airlifted 479 people, including many senior citizens, hoisting them one-by-one on to helicopters, before the weather subsided on Sunday and a tow could begin. A total of 1,373 people had started the voyage and about 900 people were still on board as the ship arrived on Sunday afternoon at the port of Molde on Norway’s west coast. “It was very nearly a disaster. The ship drifted to within 100 metres of running aground before they were able to restart one of the engines,” police chief Hans Vik, who heads the Joint Rescue Coordination Centre for southern Norway, told the TV2 broadcaster. Some 20 injured passengers had been taken to hospital, Viking Cruises said, while others had only minor injuries. “Many have also been traumatised by the experience and need care when they arrive on shore,” the Norwegian Red Cross said. “I have never seen anything so frightening,” said Janet Jacob, who was rescued. “I started to pray. I prayed for the safety of everyone on board,” she told the NRK television channel. Norwegian Prime Minister Erna Solberg expressed her gratitude to those who responded to what she called a “dramatic day”. “Thank you to the talented rescuers, volunteers and others who have made an invaluable effort in demanding conditions,” she wrote on Twitter. Stormy weather conditions had improved by Sunday afternoon, with winds halved to 12 metres per second, according to the Norwegian Meteorological Institute. 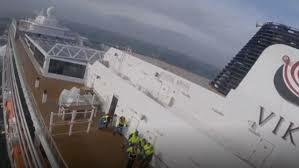 Images and video posted by passengers on social media showed furniture sliding around and panels falling from the ceiling as the vessel drifted in waves of up to eight metres. “We were having lunch when it began to shake,” John Curry, a passenger from the United States, told public broadcaster NRK. Torstein Hagen, the founder and chairman of Viking Cruises, met some of those who had been airlifted. “We all want to know how this could have happened,” the Norwegian billionaire said.